ОВА СТРАНИЦА УКРАТКО: Како би се очувала неутрална тачка гледишта, идеји која нема широку подршку у општеприхваћеној научној литератури у датој области не сме се дати претеран значај у чланку о општеприхваћеној идеји. Таквим идејама се може посветити више простора само у чланцима о њима, уколико су довољно релевантне да би имале свој чланак. Одговоре на питања и помоћ око конкретних примера, можете добити на Тргу или на страни за разговор конкретног чланка. На Википедији се представљају значајна мишљења која треба да буду заступљена сразмерно њиховом значају. Википедијин чланак о маргиналној теорији не сме ту теорију представити значајнијом него што она заиста јесте. Све тврдње морају бити засноване на независним поузданим изворима. Идеји која нема широку подршку у општеприхваћеној научној литератури у датој области не сме се дати претеран значај у чланку о општеприхваћеној идеји,[a] и морају бити наведени поуздани извори који успостављају озбиљну и значајну везу између маргиналне идеје и општеприхваћене идеје. За ово постоје бројни разлози. Википедија није и не сме да постане извор који промовише или оправдава безначајне идеје и субјекте. Википедија није форум за оригинална истраживања. [b] Како би се чланци о контроверзним идејама писали на неутралан начин, од виталног је значаја да уредници Википедије уносе у чланке само оно што је већ написано у независним секундарним изворима разумне поузданости и квалитета. Релевантне политике у вези са маргиналним теоријама су три кључне политике које одређују квалитет садржаја на Википедији, неутрална тачка гледишта, без оригиналног истраживања и проверљивост. Ове политике заједно налажу да чланци не би требало да садрже било какве књижевне анализе или синтезе, да је за материјал који би могао бити оспорен потребан поуздан извор, и да сви већински и значајни мањински погледи који су објављени у поузданим изворима треба да буду заступљени пропорционално њиховој заступљености и значају. Уколико се јави билко каква недоследност између ове смернице и садржаја релевантних политика, политике увек имају предност. 1 Како идентификовати маргиналне теорије? Термин „маргинална теорија“ користимо у веома широком смислу да опишемо идеје које значајно одступају од преовлађујућег или „мејнстрим“ погледа у одређеној области. Научно мишљење је генерално најауторитативније за идентификацију преовлађујућег погледа, уз два изузетка: научно мишљење не постоји за сваку тему, и мишљењима научника који су се специјализовали у другој области не сме бити дат претеран значај. На пример, маргиналне теорије у науци значајно одступају од „мејнстрим“ науке и имају врло малу или никакву научну подршку. Други примери укључују теорије завере и езотеричне тврдње о медицини. When discussing topics that reliable sources say are pseudoscientific or fringe theories, editors should be careful not to present the pseudoscientific fringe views alongside the scientific or academic consensus as though they are opposing but still equal views. While pseudoscience may in some cases be significant to an article, it should not obfuscate the description or prominence of the mainstream views. 1. Obvious pseudoscience: Theories which, while purporting to be scientific, are obviously bogus may be so labelled and categorized as such without more justification. For example, since the universal scientific view is that perpetual motion is impossible, any purported perpetual motion mechanism (such as Stanley Meyer's water fuel cell) should be treated as pseudoscience. 2. Generally considered pseudoscience: Theories which have a following, such as astrology, but which are generally considered pseudoscience by the scientific community may properly contain that information and may be categorized as pseudoscience. 3. Questionable science: Theories which have a substantial following but which some critics allege to be pseudoscience, may contain information to that effect; however it should not be described as unambiguously pseudoscientific while a reasonable amount of academic debate still exists on this point. 4. Alternative theoretical formulations: Alternative theoretical formulations from within the scientific community are not pseudoscience, but part of the scientific process. Such theoretical formulations may fail to explain some aspect of reality, but, should they succeed in doing so, will usually be rapidly accepted. For instance, the theory of continental drift was heavily criticised because there was no known mechanism for continents to move. When such a mechanism was discovered, it became mainstream as plate tectonics. To determine whether something falls into the category of pseudoscience or merely an alternative theoretical formulation, consider this: Alternative theoretical formulations generally tweak things on the frontiers of science, or deal with strong, puzzling evidence—which is difficult to explain away—in an effort to create a model that better explains reality. Pseudoscience generally proposes changes in basic scientific laws or reality in order to allow some phenomenon which the supporters want to believe occurs, but lack the strong scientific evidence that would justify such major changes. Pseudoscience usually relies on attacking mainstream scientific theories and methodology (as is common among Biblical creationists), relies on weak evidence (such as anecdotal evidence or weak statistical evidence, as for example in parapsychology), or indulges a suspect theoretical premise (such as the claims of water memory made by advocates of homeopathy). Reliable sources are needed for any article in Wikipedia. They are needed in order to demonstrate that an idea is sufficiently notable to merit a dedicated article about it; and for a fringe theory to be discussed in an article about a mainstream idea, reliable sources must discuss the relationship of the two as a serious matter. Reliable sources on Wikipedia include peer-reviewed journals; books published by university presses; university-level textbooks; magazines, journals, and books published by respected publishing houses; and mainstream newspapers. Academic and peer-reviewed publications are usually the most reliable sources in areas where they are available, but material from reliable non-academic sources may also be used in these areas. Subjects receive attention in Wikipedia in proportion to the level of detail in the sources from which the article is written. For example, if the only references to a particular subject are in news sources, then a level of detail which is greater than that which appears in these news sources is inappropriate, because Wikipedia policy prohibits original research. The no original research policy strongly encourages the collection and organization of information from existing secondary sources, and allows for careful use of primary sources. The neutral point of view policy requires that all majority and significant-minority positions be included in an article. However, it also requires that they not be given undue weight. A conjecture that has not received critical review from the scientific community or that has been rejected may be included in an article about a scientific subject only if other high-quality reliable sources discuss it as an alternative position. Ideas supported only by a tiny minority may be explained in articles devoted to those ideas if they are notable. For a fringe theory to be considered notable, it is not sufficient that it has been discussed, positively or negatively, by groups or individuals, even if those groups are notable enough for a Wikipedia article. To be notable, secondary reliable sources must have commented on it, disparaged it, or discussed it. Otherwise it is not notable enough for a dedicated article in Wikipedia. Many encyclopedic topics can be evaluated from a number of different perspectives, and some of these perspectives may make claims that lack verification in research, that are inherently untestable, or that are pseudoscientific. In general, Wikipedia should always give prominence to established lines of research found in reliable sources and present neutral descriptions of other claims with respect to their historical, scientific, and cultural prominence. Claims that are uncontroversial and uncontested within reliable sources should be presented as simple statements of fact – e.g. "An electron has a mass that is approximately 1/1836 that of the proton." Claims derived from fringe theories should be carefully attributed to an appropriate source and located within a context – e.g. "There are extreme academic views such as those of Jacques Halbronn, suggesting at great length and with great complexity that Nostradamus's Prophecies are antedated forgeries written by later hands with a political axe to grind." Such claims may contain or be followed by qualifiers to maintain neutrality – e.g. "Although Halbronn possibly knows more about the texts and associated archives than almost anybody else alive (he helped dig out and research many of them), most other specialists in the field reject this view." – but restraint should be used with such qualifiers to avoid giving the appearance of an overly harsh or overly critical assessment. This is particularly true within articles dedicated specifically to fringe ideas: Such articles should first describe the idea clearly and objectively, then refer the reader to more accepted ideas, and avoid excessive use of point-counterpoint style refutations. It is also best to avoid hiding all disputations in an end criticism section, but instead work for integrated, easy to read, and accurate article prose. Notable perspectives which are primarily non-scientific in nature but which contain claims concerning scientific phenomena should not be treated exclusively as scientific theory and handled on that basis. For example, the Book of Genesis itself should be primarily covered as a work of ancient literature, as part of the Hebrew or Christian Bible, or for its theological significance, rather than as a cosmological theory. Perspectives which advocate non-scientific or pseudoscientific religious claims intended to directly confront scientific discoveries should be evaluated on both a scientific and a theological basis, with acknowledgment of how the most reliable sources consider the subjects. For example, creationism and creation science should be described primarily as religious and political movements and the fact that claims from those perspectives are disputed by mainstream theologians and scientists should be directly addressed. Fringe theories that oppose reliably sourced research – denialist histories, for example – should be described clearly within their own articles, but should not be given undue weight in more general discussions of the topic. 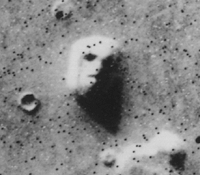 Even demonstrably incorrect assertions and fringe theories like the Face on Mars can merit inclusion in an encyclopedia—as notable ideas in the public eye. Articles which cover controversial, disputed, or discounted ideas in detail should document (with reliable sources) the current level of their acceptance among the relevant academic community. If proper attribution cannot be found among reliable sources of an idea's standing, it should be assumed that the idea has not received consideration or acceptance; ideas should not be portrayed as accepted unless such claims can be documented in reliable sources. However, a lack of consideration or acceptance does not necessarily imply rejection, either; ideas should not be portrayed as rejected or labeled with pejoratives such as pseudoscience unless such claims can be documented in reliable sources. Ideas that have been rejected, are widely considered to be absurd or pseudoscientific, only of historical interest, or primarily the realm of science fiction, should be documented as such, using reliable sources. Ideas that are of borderline or minimal notability may be mentioned in Wikipedia, but should not be given undue weight. Wikipedia is not a forum for presenting new ideas, for countering any systemic bias in institutions such as academia, or for otherwise promoting ideas which have failed to merit attention elsewhere. Wikipedia is not a place to right great wrongs. Fringe theories may be excluded from articles about scientific topics when the scientific community has ignored the ideas. However, ideas should not be excluded from the encyclopedia simply because they are widely held to be wrong. By the same token, the purpose of Wikipedia is not to offer originally synthesized prose "debunking" notable ideas which the scientific community may consider to be absurd or unworthy. Criticisms of fringe theories should be reported on relative to the visibility, notability, and reliability of the sources that do the criticizing. Wikipedia is also not a crystal ball: While currently accepted scientific paradigms may later be rejected, and hypotheses previously held to be controversial or incorrect sometimes become accepted by the scientific community (such as plate tectonics), it is not the place of Wikipedia to venture such projections. If the status of a given idea changes, then Wikipedia changes to reflect that change. Wikipedia primarily focuses on the state of knowledge today, documenting the past when appropriate (identifying it as such), and avoiding speculation about the future. One important bellwether for determining the notability and level of acceptance of fringe ideas related to science, history or other academic pursuits is the presence or absence of peer reviewed research on the subject. While a lack of peer-reviewed sources does not automatically mean that the subject should be excluded from Wikipedia, there must be adequate reliable sources to allow the subject to be covered in sufficient detail without engaging in original research. Care should be taken with journals that exist mainly to promote a particular viewpoint. Journals that are not peer reviewed by the wider academic community should not be considered reliable, except to show the views of the groups represented by those journals. Peer review is an important feature of reliable sources that discuss scientific, historical or other academic ideas, but it is not the same as acceptance by the scientific community. It is important that original hypotheses that have gone through peer review do not get presented in Wikipedia as representing scientific consensus or fact. Articles about fringe theories sourced solely from a single primary source (even when it is peer reviewed) may be excluded from Wikipedia on notability grounds. Likewise, exceptional claims in Wikipedia require high-quality reliable sources. Wikipedia is meant to be a tertiary source of information, summarizing the information gleaned from secondary sources, and in some cases from primary sources. Primary sources about research and investigations should only be used to verify the text and should not be relied upon exclusively as doing so would violate Wikipedia's policies on original research. In the case of obscure fringe theories, secondary sources that describe the theories should be carefully vetted for reliability. While proper attribution of a perspective to a source satisfies the minimal requirements of Wikipedia's neutral point of view, there is an additional editorial responsibility for including only those quotes and perspectives which further the aim of creating a verifiable and neutral Wikipedia article. Quotes that are controversial or potentially misleading need to be properly contextualized to avoid unintentional endorsement or deprecation. What is more, just because a quote is accurate and verifiably attributed to a particular source does not mean that the quote must necessarily be included in an article. The sourced contribution must simply aid in the verifiable and neutral presentation of the subject. The Bigfoot Field Researchers Association has stated, "Scientists from various disciplines put the most compelling sasquatch evidence to the test. Collectively their conclusions are ground-breaking. There is now scientific proof for the existence of a giant primate species in North America – a species fitting the descriptions of sasquatches (bigfoots)." Including such a controversial quote needs to be carefully contextualized as a particular point-of-view. Simply including such a statement in the lead or in a section on scientific evaluation of bigfoot claims is potentially misleading, non-neutral, and lacking in verifiability. The quote should only be included if it can be contextualized in a verifiable and neutral sense as a point-of-view of the Bigfoot Field Researchers Association and not necessarily a factual statement. The consensus of editors may even be to not include the quote at all. The best sources to use when describing fringe theories, and in determining their notability and prominence, are independent reliable sources. In particular, the relative space that an article devotes to different aspects of a fringe theory should follow from consideration primarily of the independent sources. Points that are not discussed in independent sources should not be given any space in articles. Independent sources are also necessary to determine the relationship of a fringe theory to mainstream scholarly discourse. Inclusion and exclusion of content related to fringe theories and criticism of fringe theories may be done by means of a rough parity of sources. However, if an article is written about a well-known topic, it should not include fringe theories that may seem relevant but are only sourced by obscure texts that lack peer review. Note that fringe journals exist, some of which claim peer review. Only a very few of these actually have any meaningful peer review outside of promoters of the fringe theories, and should generally be considered unreliable. Examples of unreliable journals include: The Creation Science Quarterly, Homeopathy, Journal of Frontier Science (which uses blog comments as its supposed peer review), and many others. In an article on a fringe topic, if a notable fringe theory is primarily described by amateurs and self-published texts, verifiable and reliable criticism of the fringe theory need not be published in a peer reviewed journal. For example, the Moon landing conspiracy theories article may include material from reliable websites, movies, television specials, and books that are not peer reviewed. By parity of sources, critiques of that material can likewise be gleaned from reliable websites and books that are not peer reviewed. Of course, for any viewpoint described in an article, only reliable sources should be used; Wikipedia's verifiability policy is not suspended simply because the topic is a fringe theory. Parity of sources may mean that certain fringe theories are only reliably and verifiably reported on, or criticized, in alternative venues from those that are typically considered reliable sources for scientific topics on Wikipedia. For example, the lack of peer-reviewed criticism of creation science should not be used as a justification for marginalizing or removing scientific criticism of creation science, since creation science itself is almost never published in peer-reviewed journals. Likewise, views of adherents should not be excluded from an article on creation science solely on the basis that their work lacks peer review, other considerations for notability should be considered as well. Fringe views are properly excluded from articles on mainstream subjects to the extent that they are rarely if ever included by reliable sources on those subjects. The prominence of fringe views needs to be put in perspective relative to the views of the entire encompassing field; limiting that relative perspective to a restricted subset of specialists or only amongst the proponents of that view is, necessarily, biased and unrepresentative. The careful use of sources is vital when writing about criticism of fringe theories. Since fringe theories may be obscure topics that few non-adherents write about, there may only be a small number of sources that directly dispute them. Care should be taken not to mislead the reader by implying that, because the claim is actively disputed by only a few, it is otherwise supported. Particularly harsh criticism should be attributed – "Philosopher A. C. Grayling dismisses intelligent design as 'a little driblet of childish ignorance; a mark of mankind's infancy.'" – while simple facts – "humans and chimpanzees evolved from a common ancestor" – are best left stated simply as facts rather than recast as opinions. Be careful not to use in-text attribution carelessly to imply that only the named sources would agree. A careful use of words and the adoption of a disinterested tone will ensure that a reader is not spoonfed opinions as facts and vice-versa. Fringe theories may be mentioned in the text of other articles only if independent reliable sources connect the topics in a serious and prominent way. However, meeting this standard indicates only that the idea may be discussed in other articles, not that it must be discussed in a specific article. If mentioning a fringe theory in another article gives undue weight to the fringe theory, discussion of the fringe theory may be limited, or even omitted altogether. If no independent reliable sources connect a particular fringe theory to a mainstream subject, there should not even be a link through a see also section, lest the article serve as a coatrack. Occasionally, uncontroversial ideas will need to be referred to in relation to fringe theories. Such ideas should be sourced by reliable mainstream sources. Links to non-fringe articles in fringe articles can also help aid the reader in understanding and remove the threat of creating a walled garden. In contrast, many mainstream articles do not link to articles about fringe theories. This is the principle of one-way linking for fringe theories. Astrology – There are plenty of reliable sources which describe how astronomy is not astrology, and so a decent article on the former may mention the latter. Autodynamics – There are no reliable sources about special relativity which also mention autodynamics, and so a decent article on special relativity should not mention autodynamics. Note, however, that the mainstream scientific subjects are discussed and linked to in both of the articles above that are about the fringe subjects. Creation Science – The overwhelming majority of scientists consider this to be pseudoscience and say that it should not be taught in elementary public education. However the very existence of this strong opinion, and vigorous discussion regarding it amongst groups such as scientists, scientific journals, educational institutions, political institutions, and courts of law give the idea itself more than adequate notability to have articles about it on Wikipedia. Moon landing conspiracy theories – Conspiracy theories which aim to show that the moon landings were fake, while probably not held as true by very many people, have generated enough discussion in books, television programs, debunking statements from NASA, etc., that they deserve an article on Wikipedia. Paul is dead – a famous urban legend alleging that Paul McCartney of The Beatles died in 1966 and was replaced by a look-alike, sound-alike duplicate named William Campbell. Denied by all four Beatles (including McCartney, who is alive and well ажурирано: 2011[update]. г. ), this conspiracy theory was fueled by "clues" found among The Beatles' many recordings. The rumour has been the topic of much sociological examination because its development, growth and rebuttal took place very publicly, owing to The Beatles' enormous popularity. Theories of Booth's escape – The page on John Wilkes Booth includes descriptions of conspiracy theories contending that Booth eluded his pursuers and escaped. However, they are not notable enough for a dedicated article. Reptoid hypothesis – The page on conspiracy theorist David Icke describes his claim that many world leaders are actually shape-shifting reptilians from the constellation Draco. This conspiracy theory is not notable enough for a dedicated article. Ова страница је последњи пут уређена на датум 11. октобар 2013. у 06:32 ч.